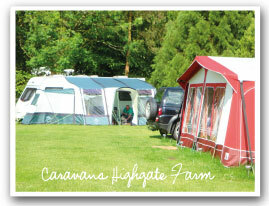 About Highgate Farm Caravan Park Norfolk, Norfolk's Favourite Campsite! Lesley & Mike Smith have been running Highgate Farm Caravan Park now for over 16years. 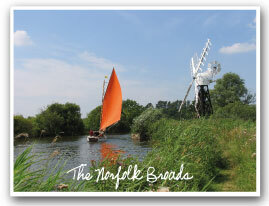 It is set in the heart of the Norfolk Broads with many interesting places to visit close by. Sheltered by trees and shrubs, well maintained with levelled grass ( no grazing animals ) With separated Ladies and Gents shower and toilet blocks. There are lots of things you can do near by please see the list below and visit the Attractions page. The famous Golden Sands of Great Yarmouth are 3 miles away, with Rollesby, Acle, Potter Heigham, and Cromer for Boat Hire also close by. Thrigby, Banham, Kessingland, Cromer for a visit to the zoo. 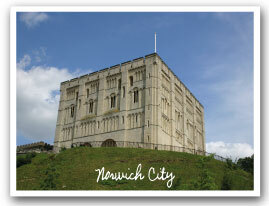 Norwich City for a visit to the Castle and museum and excellent shopping. Pleasure Beach and Pleasurewood Hills for Theme parks. Why not visit the country retreat of H.M. Queen and Many many more places to visit. All the above-mentioned places are within 2- 30 miles away. We have a resident fly fishing tutor who can be available for group instruction and one to one lessons. Trout and Salmon fishing trips can be arranged in advance. Eating OutThere are several excellent places to eat near by. What time can I/we arrive? What time must I/we leave? We ask that you move off your pitch before 11.00am on the day of departure unless otherwise agreed. Are my pets welcome at Highgate? Yes pets are welcome at Highgate, dogs are to be kept on a lead and cleared up after in accordance with caravan club rules. How close are we to Norwich? We are approximately 12 miles which is a short 20minute Car ride. Can we BBQ on site?